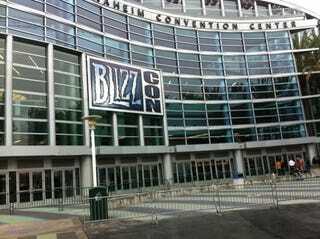 BlizzCon? More like DrizzCon, am I right? No? Still BlizzCon? Either way, we'll be bringing you news, videos, and more cosplay than you can shake Thrall's hammer at all weekend long. We'd have had more stuff for you already, but the Alamo Inn & Suites in Anaheim only had enough internet to assure me that there was internet there when I arrived on Thursday. Then it exploded. The man in the lobby was very sad, as he could not check his email. But now we're back at the show and ready to go. Look for a massive cosplay post to hit early today, followed by a whole slew of fun and exciting Blizzard-based news. For the Hordes...of people outside waiting for the doors to open before the rain starts up again!